We have three children under six and we live in a two bedroom house, which means that of late we have found ourselves desperately trying to figure out how to get all three of our kids to sleep in the same room at the same time. I'm not gonna lie -- it hasn't been going that well. When we first moved into this home we had one 7-month-old baby. Having moved from a one-bedroom apartment, this place felt downright ENORMOUS. I mean SIX WHOLE ROOMS. What would we ever do with that amount of space? What we ended up doing was having two more kids in the next three years - - and suddenly our castle started feeling much more like a tiny little cabin. When my second son was born, we optimistically set up the "kids' room" with a nice white crib right alongside his brother's "Big Boy Bed". What we failed to foresee was that older brother would see this as an open invitation to leap upon his supine brother Wrestlemania-style whenever we placed him down at rest time. Scrambling to protect our baby's delicate internal organs, we opted to move him to a Pack-n-Play in the living room until he was able to gain control of his limbs and scurry away from his older bro's athletic enthusiasm. When our second son hit the 18-month mark we felt it was time to move the boys back together. And a whole new set of problems began. …at which point a room-destroying party of truly epic proportions would commence. Those two boys would unleash themselves upon their surroundings like rabid baboons, pulling clothes from the drawers, breaking toys left and right, and at one particularly low point ripping their entire dresser from where it was bolted (BOLTED!) to the wall, toppling it onto the floor and then gallivanting atop it "Lord of the Flies" style. I'm telling you people, Charlie Sheen would have been like, "Tone it down a notch, guys. You're embarrassing yourselves." 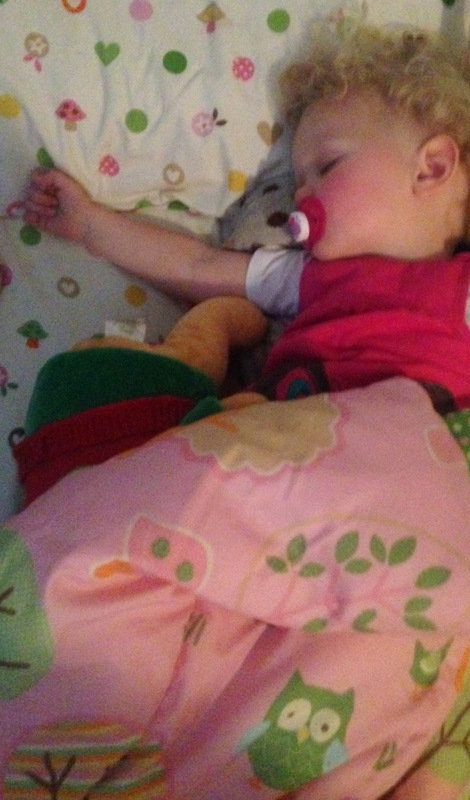 Can you spot the two year old in this actual bedtime photo? And you're probably thinking to yourself -- why didn't you just, you know, stop them? Well, I'll tell you why! 1. Because it was 8pm and I didn't have the energy. 2. Sometimes toddlers scare me. In fairness, I did make a promise to myself that I would get up and intervene if anyone started an actual fire. Eventually the boys would tire themselves out with all their manic carnage, and at about 9pm we'd go pick them up from wherever they'd landed prone on the floor and put them back in their beds for the night. The system had its flaws, but it was actually fairly effective. Before long the excitement of all-brother bedtime wore thin and our evenings calmed down significantly. That is, until we added a little sister to the mix. After her own long months of Pack-n-Play confinement, a few weeks ago our daughter was ready for her transfer to "the kids' room". We'd been through this difficult phase before and we felt pretty prepared. But the truth is that nothing -- NOTHING could have prepared us for the reality of three in one room. The arrival of their younger sibling seemingly brought all of our sons' room-destroying instincts back to the fore. And as for their sister? It's as if the very act of turning off the lights each evening awakens deep within our daughter a dormant party animal with a burning need to host her very own super-rockin' all-night toddler-fest. END TIME - ANYONE'S GUESS!!!!! See How Loudly I Can Shriek Like an Injured Orangutan! Slam One of My Roommates' Fingers in the Sliding Door! NOW HARDER! This Toy Is Mine! Can You Not Tell By My Hours-Long Tantrum That All I Say Is True???? Is This Something I Should Eat? Even Though Mom Specifically Told Me Eight Times That It's Not?? I Know! I'll Take the Hair Off My Brothers' Eyebrows Using Only My Hands! WAKE UP! WAKE UP! It's Morningtime! Ha-Ha - Just Kidding It's 11:30pm and I Haven't Fallen Asleep Yet!! Bounce On My Bed! Bounce On Another Bed! Bounce On a Sleeping Brother's Head!!! Even my sons have lost their enthusiasm at this point. Sure they love a raucous late-night bacchanal as much as the rest of the under-six set, but this girl? She's too much even for them. My oldest emerged yesterday morning, eyes bloodshot from lack of sleep, and laid his hand on my arm. "Mom", he said seriously, "You've got to do something about her. She's just too crazy." So our daughter's been banished. She's no longer welcome in the kids' room at bedtime. Instead, we've taken the mattress off of her bed and placed it in the corner of the playroom where she can run wild until finally passing out, often after everyone else in the house is fast asleep. It's a solution for now. Do not be fooled by adorable owl sheets. SHE'S A MENACE! Or we find a bigger house.